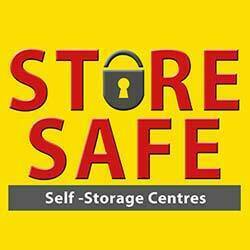 If you’re moving your furniture into a Store-Safe unit in Stoke, you might have large items to move. Moving heavy furniture the right way will ensure you don’t damage walls, floors, the furniture and your back. Here are 6 tips when moving heavy objects. Measure the piece of furniture and your exits. You might need to remove a door to get it through a gap. Try and do this a few days before the move so that everything is ready on the day as this will save you time and stress. If you’re moving a desk, a set of drawers or a unit make sure they are completely empty. This will make it less heavy and the contents won’t drop out and get lost during the move. If the piece of furniture has parts you can take off, then it’s worth doing. It will mean it’s easier to get through gaps and parts won’t scratch the floors or damage the walls as you’re manoeuvring the furniture around. Store screws and bolts in a labelled bag and larger parts in a box. If you’re not sure if parts can be removed check your instructions. If you don’t have them check online. Protect items from damage by wrapping corners, arms and legs in bubble wrap or wrapping parts up in a blanket. Heavy objects can be moved without too much stress if you have the right tools. Use carpet, cardboard or gliders underneath furniture so that it will slide across the floor. Do this by pushing rather than pulling because it is much better for your back. Furniture Lifting straps are idea for large and heavy items like a sofa or a washing machine. The straps will protect your back and make a heavy load easier to handle. If you don’t want the stress of moving your own furniture Store-Safe have a man in a van collection and packing service. The collection service is free. All you need to do is give us a call on 01782 785 370 or fill in the online contact form. Then tell us what you need, and we can sort out a quote and make the pick-up and/or storage arrangements.